On a drive along Highway 41 near the hamlet of Hilda, soil health specialist Yamily Zavala spotted a field containing sunflowers, a plant that she happens to incorporate in cover cropping studies at the Chinook Applied Research Association (CARA) facility in Oyen just over an hour to the north. Curious, she pulled over and immediately knew she’d found something special. “What caught my attention was the composition of the material that was there,” she said. This was clearly a great soil system exhibiting excellent turnover of its abundant organic matter, which improves nutrient recycling, water-holding capacity and more. “I was amazed. Amazed,” said Zavala. “What I saw there, I haven’t seen in the whole province.” In fact, this farm in southeast Alberta had soil similar to what she’d seen while working as a consultant on a West African rainforest cocoa plantation. This chance discovery represents the coalescence of a trifecta of soil health practices that were in substantial part pioneered in Alberta. 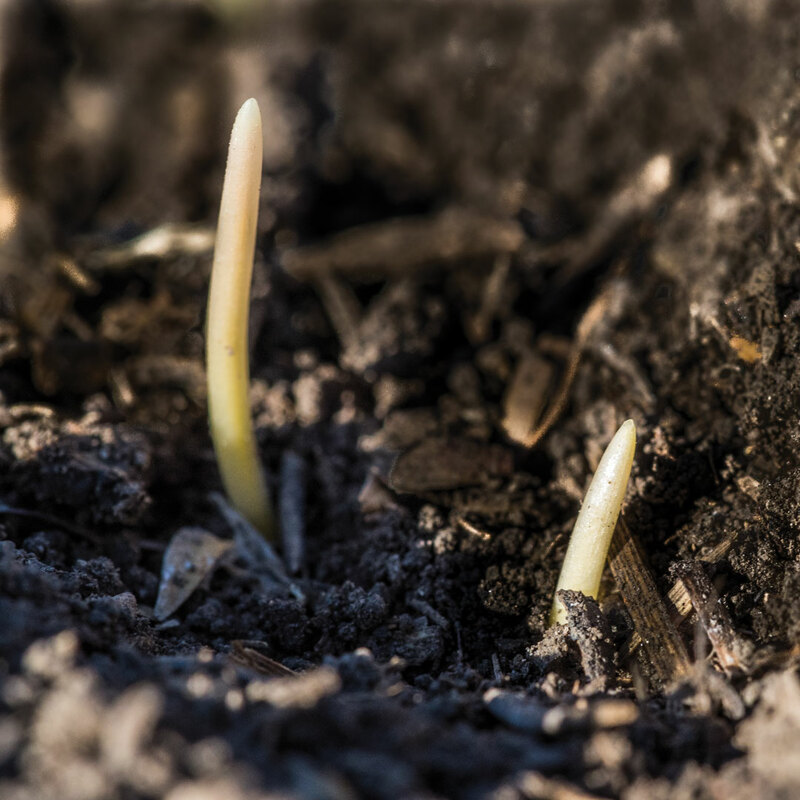 Soil health and its pillars of zero-tillage, crop rotation and cover cropping have captured the imagination of farmers and the non-farming public alike. Rejuvenating the soil ecosystem, or microbiome, is being increasingly examined as a means of preventing erosion, managing moisture, retaining nitrogen and restoring carbon as well as aiding weed and pest suppression. Though implementation has its challenges, according to its advocates this suite of practices can boost sustainability and economic return. The exceptional soil Zavala found near Hilda contained a great deal of organic matter in various stages of decomposition, but also relatively little surface residue. “Which is a really good indication there has been good turnover,” said Zavala. “That’s what we need in the system, that you can turn over the organic matter so that you can take advantage of all the benefits from nutrient recycling and more water-holding capacity. All this happens when you increase the organic matter in the soil.” She soon learned that the land belonged to Andy Kirschenman, a farmer deeply committed to improving his soil and his bottom line. Raised on a farm near Wrentham, his initial motivation to improve soil health was tackling wind erosion and its hallmark black blizzards, Prairie dust clouds that closed highways and filled irrigation canals and ditches with silt. Prior to the introduction of no-till, southern Alberta farming also involved little re-cropping and no rotation, and wheat or barley fallow was only occasionally followed by flax or mustard, said Lindwall. Though an economical model for no-till didn’t then exist, research revealed in principle that cultivation was unnecessary and yields were as good or better without it. “Our freeze-thaw cycle and self-mulching soils, by nature, tend to sort of till themselves, and then once you get a little earthworm activity, that helps,” said Lindwall. Additionally, he and fellow researchers found summer fallow to be quite inefficient at conserving water, but that standing stubble did so by trapping snow. Interest in the implications soon grew as word spread that with fertilizer, continuous cropping was possible in southern Alberta. Despite the challenge to conventional wisdom and the existing economic model, innovative farmers and forward-looking ag groups pushed the industry to develop air seeding technology that, with increased surface moisture, allowed a wider variety of crops to be grown and launched the canola revolution. The key to maintaining good soil, he emphasized, is to have something growing in it as much as possible. Nowhere in North America has this mantra been adopted with more enthusiasm than in the American Midwest, where cover cropping has received substantial government support. Where the U.S. crop sector once adopted no-till practices pioneered in Alberta, this is where the influence in soil health practices returns north. Deen cites long-term rotation trials done at the University of Guelph that demonstrate the addition of wheat to corn-soybean rotation can boost corn yield by around five per cent and soybeans by up to 14 per cent. He also suggested the rotation effect has been underestimated given that it has produced even higher gains in recent drought years. “For the same reason, cover crops are starting to resonate,” he said. “My sense is that interest at the environmental level and agronomic level is translating into research activity,” he said. In Western Canada, where no-till is standard practice and crop rotation is employed to various degrees, the uptake of cover cropping is slower given the shorter growing season. Though the crop mix is different, Deen suggested that the challenges and potential rewards of adopting soil health practices are similar for Ontario and the Prairies. “How do you get a third crop or a fourth crop into the system? That’s the million-dollar question.” Additionally, cover cropping may add complexity, where simplification of management practice is desirable, including where farmers do not own the land they’re working. However, Prairie farmers are experimenting with rotation and cover cropping. Kirschenman, whose rich soil so impressed Zavala, grows a range of crops that includes durum wheat, rye, flax, triticale, canola, sunflowers and corn. Kirschenman said his interest in soil health has been primarily economic—to reduce inputs without decline in yield or net profit. He was particularly impressed by the results he’d seen on a trip to the Dakota Lakes Research Farm in South Dakota, which he emphasized is a money-making venture in a climate area similar to that of southern Alberta. The farm and those of its board members have been no-till for the better part of three decades and grow diverse rotations. He compares crop diversity to the reduced tillage movement, which was quickly implemented once its value was recognized. “Sometimes we want to see research projects over and over again until we really believe it works,” said Kirschenman. He suggested that the benefits are now known to the point where these practices can be put in place even if the research has not been completed. Kirschenman’s commitment to soil health is substantial and he continues to adjust his cropping practices. “We have reduced or eliminated tillage,” he said. “All our seeding is done with a disc drill into previous crop residues. There is no seedbed prep at all on our farm. We have a stripper header that we use for harvesting flax and cereals.” He also used this to harvest canola for the first time in 2017, with good results. The remaining residues increase the snow catch while decreasing wind and evaporation on the soil surface in spring. “The water you use from your soil, you want to be using through your plant; you don’t want to be losing it off the surface of the soil because it’s uncovered,” he said. This is a factor that affects the diverse, nine-year crop rotation Kirschenman is moving into. “We’re going to bump up our cereal acres because of that,” he said. Harvest 2017 drove home the need for creating good crop residue ahead of dry years. As an example, he has seen a 25 per cent yield difference in flax, depending on the quality of residue it was seeded into. He also suggested that increasing cereals in the rotation mimics the Prairie grassland ecosystem in which the fibrous roots of native grasses bind the topsoil. “We’re going to have two years of winter cereals, two years of spring cereals as well as corn within that rotation every other year with, hopefully, a broadleaf intercrop. “What we’re starting to do on our farm is to look at the things we can manage that will not significantly impact our bottom line in an above-average or exceptional year, but will allow us to preserve yield in a below-average-moisture year, or even a drought year,” said Kirschenman. He suggested these actions will include adjusting seeding rates and row spacing. Another area of attention is timing fertilizer application so as not to put it all down up front, resulting in a whole lot of plant that runs out of moisture and having nothing to put in the bin. “Maybe six out of 10 years we won’t notice a difference. One year maybe we’ll not be at the top of the yields, but two out of the 10 years, we’ll be able to run the combines rather than sit and collect crop insurance,” he said. Taking such steps to maintain yield will be even more important should those two bad years become 10, as in past drought cycles. Zavala noted that soil issues are similar across the province. Farmers are looking to remedy compaction and lack of organic material. She suggested that cover cropping alone is not an answer to soil improvement issues, but may be valuable when integrated with total management practices. Following farmer interest in the soil health trend, she has been running test plots since 2014. The results have appeared to mirror Kirschenman’s success in improving the quality of the soil. This cover crop experimentation has involved planting cocktails of varying species, with the aim of creating major soil benefits in a short period of time. In 2016, this cocktail included 32 species, among them legumes, broadleaf plants, brassicas and cereals and even soybeans. The following year, the number climbed to 40. Experimenting with the makeup and seeding rate of these mixes is also important, she noted. Zavala suggested that the choice of cover cropping species is dependent on the needs of the individual farmer. If the need is for reducing erosion, the best cover crop species are going to cover and protect most of the soil surface area. From one season to the next, the plots produced deep rooting and increased aggregation—the tendency of soil particles to bind together—as well as a decrease in compaction and substantial weed suppression. “I thought, ‘OK, there is something here. We need to measure it,’” said Zavala. She wants to quantify the results of this promising cover crop experimentation and has been approached by approximately 40 farmers who’ve taken an interest in the practice or are actively carrying it out. On their own or with input from agronomists, many farmers in northeast Alberta are planting cover crops and, little by little, farmers across the province are trying it, she said. They likewise want to see Alberta-specific data on infiltration rates, the stability of aggregation, alleviating compaction and so on. “It’s a learning process,” said Zavala, and one that requires benchmarking. To this end, she has initiated the creation of a soil health lab at the CARA facility, patterned on the soil health lab at Cornell University where she completed her PhD. Once she received approval to proceed, Zavala began to plan its creation. With a launch tentatively scheduled for spring of 2018, the lab is located in a former school building CARA has purchased. Its lab equipment was received as a donation from a shuttered soil lab in Vulcan. The facility is being renovated by a supportive local farmer. “I’m very excited because the lab is going to allow us to establish the benchmarks for soil health. Benchmarks will allow farmers to know if they are doing the right thing. Because if you don’t have a benchmark, and you don’t know what you started with, how can you compare?” Observing results over time will allow adjustments to be made in the suggested cover crop species mix for various agronomic needs. For example, if the cover crop is intended for cattle feed, the species mix can be adjusted to also target whatever constraint exists in the field, like the need for weed suppression or moisture conservation. There are roadblocks to implementing these practices, however. “Rotation is a hard one in some areas because of cash rent,” said Kirschenman. Where it’s necessary to grow the same two or three crops to compete, it’s difficult to bring another crop in that may have a lower return, but will have long-term benefits. “In a single-year contract, like most cash rents are, you’re not worried about the mid- and long-term soil health,” he said. Even in areas that enjoy Alberta’s lengthiest growing seasons, such as Kirschenman’s own southeast quadrant of the province, the Lethbridge area and the Red River Valley, there may not be adequate moisture to easily accommodate cover crops. And where moisture is sufficient, such as further north, a killing frost may come in early September. The biggest uptake in cover cropping in the province is with cattle operations, said Kirschenman. “It’s a no-brainer after a barley silage or a winter cereal silage. I think that is where a lot of the cover crops are happening now. If you’re silaging cattle, some farmers will go out and get another cut of silage off of that cover crop rather than just let that ground lay or they’ll graze it going into fall and winter. They’re basically growing two crops in one year and putting one through a cow and converting it to pounds of beef. That’s very important.” He also noted that cover crops are being used on potato fields in the Lethbridge area. Where the digging of potatoes creates potential for erosion, farmers are sowing cereals. Another related practice Kirschenman has incorporated is intercropping—growing two crops in the same field simultaneously. He said this is a way to introduce diversity and the multi-species cocktail concept within a shorter growing season. The practice may utilize two cash crops or one plus a companion crop. In the latter vein, he has grown canola and clover together and paired sunflowers with hairy vetch. He has also grown true intercrops that include peas with mustard and chickpeas with flax. Harvested together, they’re easily separated afterwards, given their size difference, using an on-farm cleaner. Kirschenman uses a rotary cleaner. “You’re using the diversity and the strengths of one of the species to offset the problems of the other species. You can grow a pea that lodges quite a bit because the mustard will hold it up.” In many regions, he said, the mustard doesn’t yield enough to be economical. But pairing it with peas, the total gross per acre comes up substantially. He estimates $90 to $120 extra net income per acre is produced this way. In flax and chickpeas, the flax acts as a disease break for the chickpeas, so inputs are diminished and the chickpeas add to the financial return. More typically, Alberta farmers have limited experience with cover crops. Dave Wolfe farms grains near La Crete in northern Alberta and is one of a handful of farmers in his area who have tried cover crops over the last two years. “I didn’t really end up with the results I wanted. It was just too dry this year,” he said. “But I will probably do it again.” With a multi-species mix that included forage brassica, hairy vetch and turnips, he seeded barley slightly deeper. Though his aim was to build soil nutrients, he also hoped to break up hardpan and suppress toadflax. While the barley grew well, the cover species remained thin. After mowing twice, when the weeds kept coming, Wolfe disked the lot under. He suggested that in future he’ll likely try a pulse or legume crop with a cereal for fibre, and that he will treat this combination as a green manure crop in the way he wound up doing with his first cover crop attempt.